Wow, it was hard to pick just two quilts to showcase in the Blogger Quilt Festival. To start, I decide to showcase my Confetti quilt. This quilt was actually made as part of a Bee - the Simply Solids Bee to be exact. I set out a bunch of neutral fabrics with a couple of brights - a navy, lime and dark pink. I absolutely fell in love with the top when I finished it, but I think the quilting is one of the main reasons I decided to use this quilt in the festival. It took a TON of ruler work on my longarm, and I'm pretty sure my hand was deformed for over a week after the fact, but it was so worth it. I randomly drew a section using my ruler, outlined it a 1/4" and then filled it in with 1/4" lines parallel to one of the lines in the shape. The hardest part of this quilt was assembling the top. When blocks came in, they were all improv blocks, but some had more white space than others. Some had a bunch of smaller pieces while others had some large ones. I couldn't figure out how to make them work, until several people suggested that I cut up some of the bee blocks to make it work. Gasp! How could I cut up something someone had worked so hard on? But then Victoria Findlay Wolfe came to visit the Boston MQG and she said that she cut up bee blocks to make one of her quilts. If Victoria could do it, so could I. This quilt finishes at 51" x 50" and was made with a bunch of assorted solids. I quilted it using So Fine #50 - Pearl. I used two layers of Quilters Dream Orient. That quilting is so creative. What a great looking quilt! I chuckled at your not wanting to cut up finished blocks. I've recently done that to simple 9-patches - it was hard to do! Beautiful! I really love the movement and the way that the quilting compliments the design of the top. This is one of my favorite quilts of yours! Love the quilt top as well as the amazing quilting you have done on this one! You must be a pro now with ruler work ;). I loved seeing these blocks pop up in the group page and it looks so amazing finished! Woot-woot! It's fabulous! Love the quilting. Absolutely lovely! The quilting is superb. This is a lovely quilt and I agree good for a quilt bee. I have admired this quilt for awhile. So glad you are entering it. This quilt is really fun to look at! 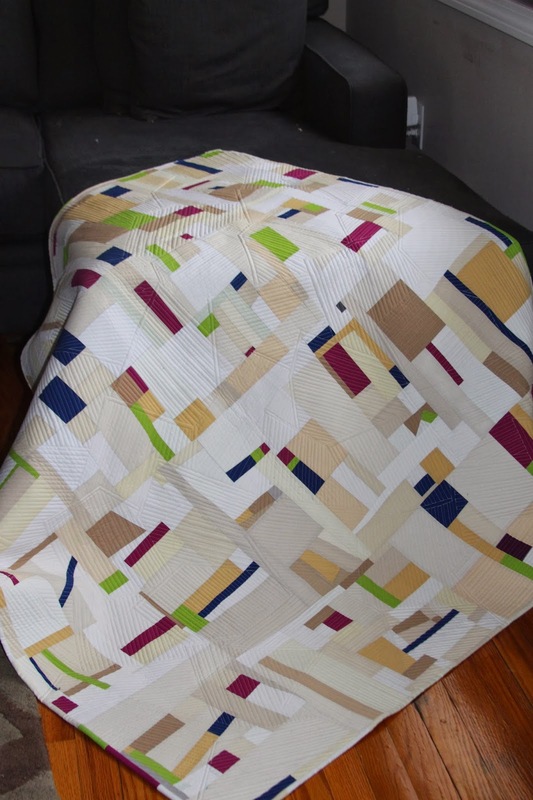 Love the use of solids and the quilting! Great work!